My obsession with wax seals extended to having our business logo turned into a seal. My fascination with the wax seal started about the same time as my fascination for all things related to Wills and Estates. In fact, if you were to ask my wife she might suggest that they emerged from the same passion. A few years ago she purchased me an old Probate document, circa 1880, that she came across on ebay. 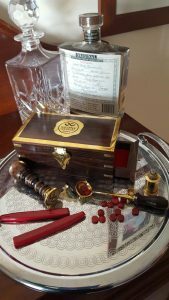 The document, relating to the settlement of an estate near Murray Bridge, was meticulously handwritten with pen and ink and came complete with its original red wax seal of Probate. It is quite special and now framed, hangs on the wall in the Conference Room in our Prospect Office. An example of an old South Australian seal of Probate circa 1880. Wax seals have long been associated with important documents and the Law. 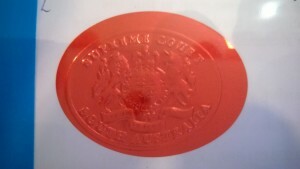 In the past it was both popular and fashionable for individuals of note to possess their own unique seal that could provide an impression into wax for the purpose of finalising a contract or as a security measure for sealing a folded letter (long before secrecy envelopes were invented). In this manner, seals were carried with the owner constantly, fashioned into a piece of jewellery such as a ring or occasionally as a pendant to be worn about the neck. Various church organisations, institutions and of course royalty, also had seals for endorsing official documents, and these were used in a similar manner. In Australia, as in many western countries, wax seals were used primarily for legal purposes. As literacy rates improved, and along with technological developments in printing, the use of seals gradually declined. Perhaps one of the few places we see an echo of this tradition is in the seals that we find on academic parchments. Legally, the only place the seal is still used with some regularity is on a ‘Grant of Probate’ document. In this situation, the red seal is no longer wax, rather a sticker that is cleverly embossed to provide an impressive endorsement for this important document. 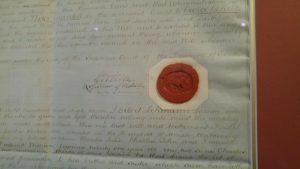 Modern example of a red seal used to indicate a Grant of Probate in South Australia. It is used in conjunction with an embossing technique. As lawyers we are often slow to embrace new technologies. While I support the move to becoming paperless, it would sadden me immensely to see this part of our legal traditional disappear completely. What do you think?